The film “Still Alice” premiered in Denmark on March 5, 2015. I went to see it the following Sunday. It was a really sunny day, so it was kind of a shame to spend it inside a theatre, but I will say it was so nice to come outside into the sunshine afterwards. While I have seen that there have been many reviews of the film, I was careful not to read them until I had seen it for myself. I think it’s nice to come in with a fresh set of eyes and to not be influenced by other people’s opinions until after forming some of my own. The synopsis of the film is, of course, based on the book by Lisa Genova. You can read a detailed synopsis of the book here, which is slightly different than the film. I got the book as a Christmas present the year it came out. I devoured that thing. Part of me was devastated, because I had been talking for a few months about writing a book that is very much along the same lines. 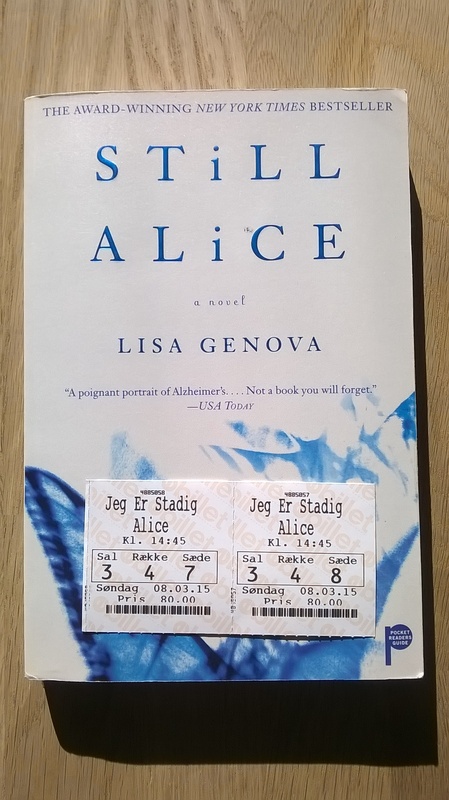 The rest of me was so happy that Lisa Genova had written the book and told the story of Alice so well – I felt like the world was a better place because this book was available. It has so much potential to educate others and is accessible to so many readers. If you can, I suggest reading the book. Like many times when a book is made into a film, the book is better. It has more detail, you go further in depth into the characters, and your own imagination adds a lot to the story. The book I wanted to write would have been based one of the most influential women I have met, Carolyn Macaulay. I was her caregiver for about 6 months back in 2005, up until I moved to Denmark from Dallas, Texas. Carolyn had the genetic variant of early onset familial Alzheimer’s disease (EOFAD) and had quit her international job with IBM as a multilingual training specialist before she turned 50. She got lost driving home from work one day and gave up the car keys that day, fearing she would hurt someone else while she was driving. Over the next two years, she phased out of her job with IBM. She was only a year or two older than my own parents when I was a caregiver for her, in her early 50s. Carolyn was so open and honest about her life, and this included her Alzheimer’s disease. She still loved being social and we could talk for hours as we went for our walks, volunteered at a local boutique, grocery shopped, or polished the silver she got as a wedding present. She was one of my best friends during that time and I miss her terribly. Anyway, this isn’t a post about Carolyn. The point of this little detour story, is that I had been wanting to write a fictional story, based loosely on Carolyn. She was the first person I knew with EOAD and the first person I knew with the genetic type. So, back to the film…. it is about a woman who has the genetic variant of EOFAD and how she and her family live with the disease and it’s progression. Dr. Alice Howland is a 50-year-old woman, played by Julienne Moore, who is a cognitive psychology professor at Harvard University and a world-renowned linguistics expert. Her husband is a successful medical researcher, played by Alec Baldwin, and they have three adult children: the eldest, a daughter expecting twins who is also a lawyer, played by Kate Bosworth (who my husband kept expecting to appear with a surf board); a medical student son, played by Hunter Parrish (who I still associate with “Weeds”); and the youngest is an aspiring actress, played by Kristen Stewart (who most of us think of from “Twilight”). In the beginning, Alice and her family are celebrating her 50th birthday out at a restaurant. She beams with happiness and seems quite fulfilled with her life – great career, great family, money to go out to celebrate at a rather nice restaurant. Here, we also see her showing signs of dementia for the first time. She is talking with her eldest daughter, Anna, and Anna’s husband, when the two daughters start to bicker with each other. The son-in-law/husband makes a comment and Alice answers about her relationship with her own sister, slightly losing the thread of the conversation. We see her going to speak in California on linguistics, where she loses her train of thought (it seems due to being distracted by not finding the word she wants to use – a symptom of aphasia, which is one of the key symptoms of dementia). She meets with the aspiring actress daughter, Lydia, afterwards. We see another symptom, where she finds information surprising, but her husband later is sure he had told her about it. And after returning home, she becomes disoriented on her daily jog around Harvard campus. This is the symptom where it becomes apparent that she notices something is wrong. She is shaken up by this, but tries to play it off as being tired to her husband. Shortly after, she makes an appointment with a neurologist. He completes some of the standard cognitive tests on Alice, and asks her to bring in someone close to her to the next appointment. She goes back in for further testing, and the neurologist informs her that she has a rare form of Alzheimer’s disease, which has an early onset (meaning before age 65). Only about 5% of people with Alzheimer’s disease (the most common form of dementia) have this early onset type, but, unfortunately, it seems to be increasing. The neurologist further reveals to Alice, that it is a particularly rare form since it is genetic (only 13% of those 5% who have the early onset type, have the genetic variant). This is known as early-onset familial Alzheimer’s disease (EOFAD). Alice and her husband sit the kids down and tell them the news, and let them know that they can be tested to find out if they also have the gene. Having the gene would mean a nearly 100% chance of developing EOFAD. Well, having the gene mutation is considered a risk factor for developing EOFAD, but genetic testing cannot be used to 100% accurately predict who will develop the disease. In fact, many prominent organizations – including the UK National Screening Committee, the World Health Organization, and the Alzheimer’s Association – do not recommend this type of early screening for dementia. This is because there is no high quality evidence showing that it is beneficial to diagnose dementia before symptoms begin and there is no research showing that patients are better off with an earlier diagnosis. In addition, earlier and more prevalent diagnosis – often called untimely diagnosis as they are made in the preclinical stage, before symptoms present – will put strain on the demand for quality dementia care, particularly for those who have a timely diagnosis – that is, after they have started to have symptoms. I found it very refreshing that the neurologist uses real questions from a battery of cognitive tests that are actually used in diagnosing dementias and that he states that they are running more tests to rule out other causes or diseases. I like when movies that are meant to be real have accurate details like this. What I didn’t like, was that Alice seemed so cheery and unaware during the appointment. I think it would be far more likely that someone who is having cognitive problems would be more nervous during such an appointment. And I definitely think it would be likely that a professor in cognitive psychology would understand the meaning of such tests and the gravity of the situation. I don’t think, if Alice were a real person, that she would be acting like it was a casual and carefree conversation. I also thought it was questionable that the doctor tells her that she likely got the EOAD gene from her father, who Alice says was an alcoholic and later developed dementia, rather than from her mother, who died in a car accident when Alice was a young girl. To me, it seems that the father’s dementia is most likely alcohol-related, or at least not EOAD, but I guess they don’t disclose the age he died. It would seem more likely that the mother who died at a young age most likely carried the gene but died before she showed symptoms of the disease. We then see Alice at the University, and her faculty head or someone in a similar position is telling her that her student reviews are quite poor, that they cannot follow her class and that it seems like Dr. Howland is having trouble following the classes herself. Alice reveals that she has EOAD, and you get the feeling that her fate is sealed in this scene. It is the first time she is revealing this to colleagues, and it also is the start of her phasing out of her work-life. It has been said out loud and people are noticing – it is now very real to her that her life will change. After leaving this meeting, she gets a call from Anna, her eldest, who tested positive for the gene. Alice’s son does not have the gene, and the youngest, Lydia, chose not to get tested. You can see the pain in Alice’s face when she learns that her daughter will most likely also have this disease one day. Alice and her husband go away to the beach house for the summer, and here we can see more of the disease progression. In particular, she is repeating questions of who is coming and when, there is one scene where she is trying to find the bathroom and doesn’t make it, which was very upsetting to her, and another where she is looking through the family photo albums and mistakes pictures of her daughters for pictures of her and her sister (who also died in the car crash with Alice’s mother). The family comes out to the beach house to visit as well. Anna has a hard time accepting the disease and acts quite rigid, while Lydia seems to want to draw closer to her mother. In fact, one of my favorite scenes is when Lydia and Alice are making dessert and Lydia asks her what it is like to have dementia. I think Julienne Moore did an outstanding job of portraying Alice. The character is usually composed, so you see hints of her confusion and frustration through facial expressions or voice fluctuations, and when she does have a stronger reaction, it really drives home the message of the frustration of having more and more severe symptoms. Alec Baldwin was an odd choice for the husband, in fact, I thought most of the casting was odd. All the supporting characters were fairly strong characters themselves, with the exception of the son-in-law. And I could recognize the actors, except for the son-in-law, from other films or shows and had a hard time picturing them as the characters in this film. Kristen Stewart seemed like she is in Twilight, a bit pouty and sad, but was maybe the best supporting role. One thing I think the film did really well, was show how the symptoms can creep in, and how the person having them is usually the first to recognize that something isn’t right and that it’s not normal forgetfulness. How they can feel isolated and lonely because other’s don’t see what they are saying or believe that it is a problem. And how it is terrifying to be losing abilities that up until recently had been taken for granted. The film did a great job at showing Alice’s viewpoint. It did not do as great of a job of showing how families respond. Yes, we see some of it, with Anna trying to control situations and with Lydia wanting to get closer with her mother. But the son, who is a medical student, hardly shows any interest in what is going on, and the husband, who is a medical researcher, does not really seem too affected by his new role as primary caregiver. It seems to be business as usual for him, and in fact, he refuses to take a sabbatical year that Alice asks him to so that they can spend the last of her days “as her” together. And the way he took the job in Minnesota could have been played up better – either that he was taking it to escape the disease and how difficult caregiving could be (although we see very little of this aspect) or that he was in denial and really thought it was a good time to be taking a job in another part of the country. It just could have been more. I feel that these intricacies of the family dynamics and reactions could have been done better. After I had seen the film, I read that one of the directors, Richard Glatzer, had another neurological disease, motor-neuron disease or ALS, diagnosed in 2001. Sadly, shortly after the film was released and winning awards, he died on March 10th, 2015. I have also read that Lisa Genova, a neuroscientist, plans to write more on neurological and degenerative diseases and has plans for a book on Huntington’s Disease. I look forward to reading them. In the meantime, if you haven’t seen the movie (or better yet, read the book), get your handkerchief ready and experience “Still Alice.” You will see dementias a little differently. And more importantly, you will see people who have dementia differently. This entry was tagged alzheimer's disease and other dementias, caregiving, education, film review, Jeg er Stadig Alice, stigma, Still Alice. Bookmark the permalink.